by Matt, posted on Saturday 27 June 2015. The Cat Machine was Greenlit by Valve! In just six days, twenty three hours and thirty minutes, the game got the attention of the Steam Greenlight team, and so I'm working towards the final build for the Steam platform right now. The first thing to say is a massive thank you to everyone that voted! It means so much. Also, secondly, to everyone who has preordered on this site so far, you'll receive a Steam Key when the game is released there, but using Steam isn't mandatory, you'll be able to download the game here without using Steam. Whichever you like! The last seven days have been a very exciting time, from the first day I flipped the switch on the Greenlight campaign, the response has been overwhelmingly positive. The second best thing about Greenlight, the first being the opportunity to get a game on Steam, of course, was the stats page. Here it's possible to see a real-time update of just how people are responding to the game. Let's take a closer look at those stats. Now, it should be noted that part of the excitement over quantifying people's responses to the game was that this was the first time a large audience of gaming fans had come into contact with the game. Most feedback to the project so far has been from the TigSource Devblog, but that's an audience of developers and hobbyists, not the general gaming public. Friends and family don't count, the bias there is too great. Friends who are developers have both problems. It's not that that feedback isn't useful, it certainly is, but it's not statistically significant, it doesn't give you an idea of the reaction that the game will get when it is released. The data on the left is tabled into columns. The right shows a nebulous average of the top fifty games listed on Greenlight. A common theme of Greenlight is the general mystery. The numbers appear fuzzed, refreshing the page in quick succession seems to show the numbers changing up and down. It's impossible to tell where that average lies, as unsurprisingly the votes are not spread evenly over every Greenlight project, the average does not equal the twenty-fifth project. My hunch is that the top ten games, or even top five games heavily drag that average up. One general observation is that, wow, my game was seriously under that average, and yet it was accepted anyway! Part of this is the good Yes/No ratio, more on that in a bit, but partly I'm guessing that's down to Greenlight's content. There's a lot of wonderful games in the voting queue on the service, of course there are, but... there's also a lot of rubbish. People uploading RPG Maker games with a few hours effort, people downloading a Unity Asset Store game template and uploading it with no changes made, among other terrible plans. On the positive side, any game that looks like it's had even a little bit of thought and hard-work put into it will leap-frog a lot of those games in the first day of voting. Unfortunately, there are some games that are just plain awful and are never going to be Greenlit ever, but, for whatever reason, they get a lot of votes. Currently, the game sat in position number one in the list is a very poorly put together game, employing a certain game's industry individual's likeness without this individual's permission, in order to make a very cheap joke. This game will never get approved by Steam, but with more than seventeen thousand votes, it'll sit on top of the rankings forever, unless it is formally denied by Valve. So the 'average' is misleading, adding yet more mystery to the proceedings. How many games, that get a cheap 'lol' and a 'yes' vote from the masses, are there? It's impossible to say. If you're planning on launching a Greenlight campaign, aim for the rankings, but rest easy knowing you don't need to beat the sixteen thousand impressions, or the three thousand, five hundred Yes votes, to get a hearing. I wasn't at my computer when The Cat Machine was Greenlit, so I didn't see what rank I was at, but I think the game was sat around the 21/22 mark. 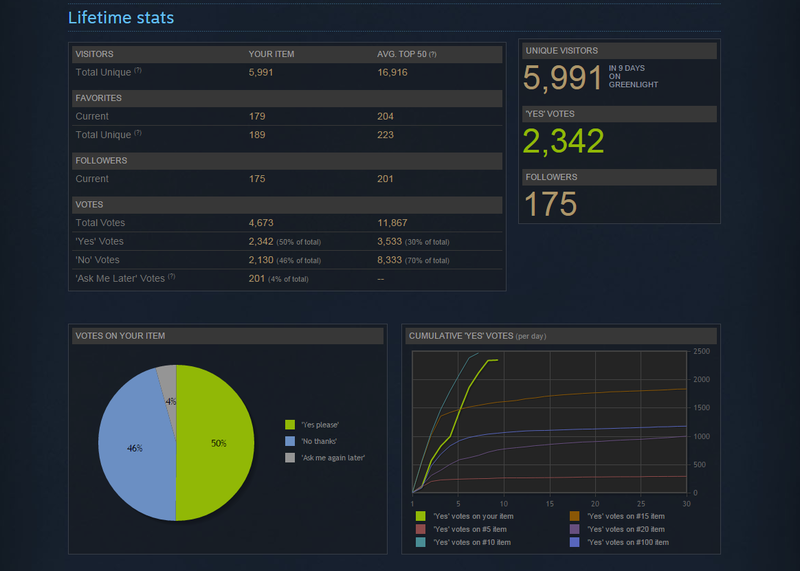 One way that the game weren't 'under average', however, was the 'Yes/No' ratio (see the pie chart in the image above). When I excitedly mention to people that the game had "over fifty percent positive votes!" it would often get a raised eye-brow, because that... doesn't actually sound very good. But remember, this is the internet, generally an intensely negative environment. And some people just hate cats. The average, however, shows that even in the top fifty, the best of the best (even if it includes some rubbish) only manage 30% positive. If you scroll through the comments thread on the Greenlight page, you'll see that almost all of them are excited about the game. Sorry to add to the general Greenlight process mystery but it's very hard to distill. My friend James (shout out to Lost Shrine, indie PR fiends) wrote a press release for the game, uploaded it to a bunch of press release... farms? Press release sanctuaries? Where press releases roam freely, I assume. We also sent it to a bunch of press people we thought might be interested in the game. Again, that's from the Greenlight stats page. The first datapoint there, isn't really a full 'day'. I hit the go button at about eight o'clock on a Thursday evening, so it was only a quarter of a day, and hardly prime vote time. The next few days the page got a lot of visitors from the Recent Submissions link on the Greenlight main page. As soon as you hit go, you're getting votes, it's a great feeling. The biggest danger though, is imagining that that effect will continue, because it certainly won't. It starts to drop at once, so here's where the press release (prepared beforehand) gets scatted to the winds. We got a few nice articles on Chinese, Japanese and a Spanish website, but no huge traffic gains. I marked on the image in red where I think the project votes would have been if PC Gamer or Kotaku hadn't written about The Cat Machine. Most Greenlight projects have one or more plateau periods, but I think The Cat Machine was quite blessed to not have even one. PC Gamer got The Cat Machine a lot of votes. One thing you'll notice from the graph, the distance between the White line (the total votes) and the Green line (total positive votes), is the smallest it got. 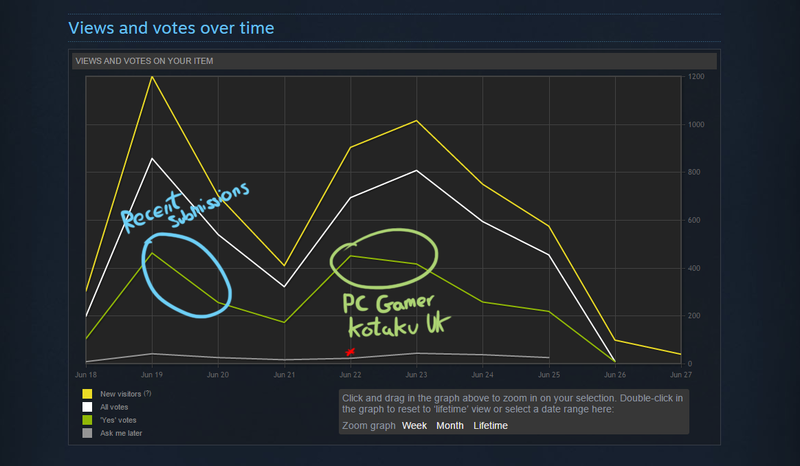 My guess is that the people who liked the look of the game and came to vote for it, really liked it. When someone clicks a link on Greenlight, it opens up the page in a new tab, but since the user probably uses the Steam client, they won't be logged in. If they want to vote for the game and try to log in, they'll probably get a code sent to them in an email, to paste into a little box, this is a security feature Valve employ. But once they log in, they're not on The Cat Machine page any more! They have to navigate to Community > Greenlight and then search "The Cat Machine" in the search box, and click the icon. A huge amount of votes came from people searching that exact phrase. If you're going to go through all those hoops, of course you're going to vote yes! It's very difficult to take any hard and fast lessons away from the campaign. "Get PC Gamer to cover your project" isn't... terribly helpful. We didn't even get a chance to try that, it just happened. The campaign got a load of traffic coming from Twitter, Facebook, VKontakte, from people's email inboxes, from forums and IRC channels. I suppose the biggest lesson is, make a game that is really easy for people to get excited about. For me, it's been a ridiculous game involving cats sitting on trains, and then they fly away. I guess people like that. The positive response has been incredibly encouraging. Thank you everyone who voted! I'm working away now to make the game as fun as I possibly can.